The Destructor Incinerator is the large capacity/big job incinerator that sets the standard for efficiency. 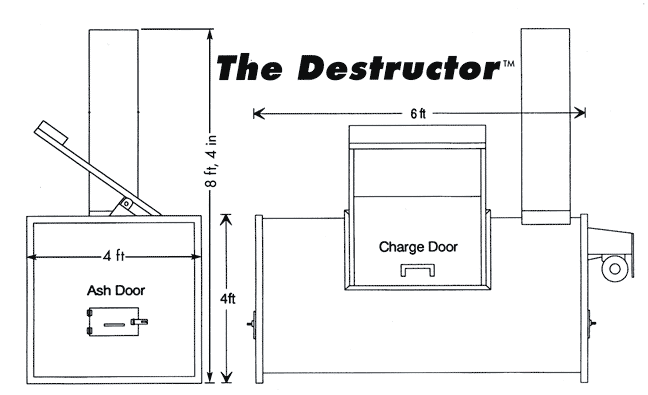 Designed with limited space in mind, The Destructor requires only a 10' x 10' area for operation to handle up to a 500 pound capacity. A weather-proof electrical control box means that The Destructor can be installed indoors or out. The Destructor very energy-efficient. Also, the use of fresh air to complete the destruction of refuse saves 50% or more over old-type burning methods. Natural or propane fuel may be used. 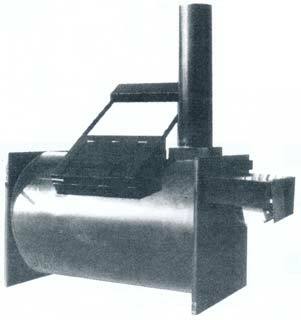 The Destructor has less smoke and odor than most incinerators and only 2% ash to remove. U.S. Environmental tests are available upon request. Every unit built by National Incinerator is constructed of the highest quality materials and built by skilled technicians. National's know-how builds into each incinerator bearing their label the assurance of long life and trouble-free operation. National Incinerator, Inc. guarantees all materials and workmanship used in the construction of its incinerator including the refractory for a one year period from date of installation. All purchased electrical parts such as burners, fans, timers, and other controls will carry the applicable manufacturer's guarantee of 90 days. Seller shall not be liable for any injury or damage to person or property or any other incidental or consequential damages. Poultry Charge Door: 17" x 24". Lining: 4" 3,000° refractory. Burners: 300,000 BTU incinimite burner with cover. Secondary chamber available upon request.